What do you call this thing again? 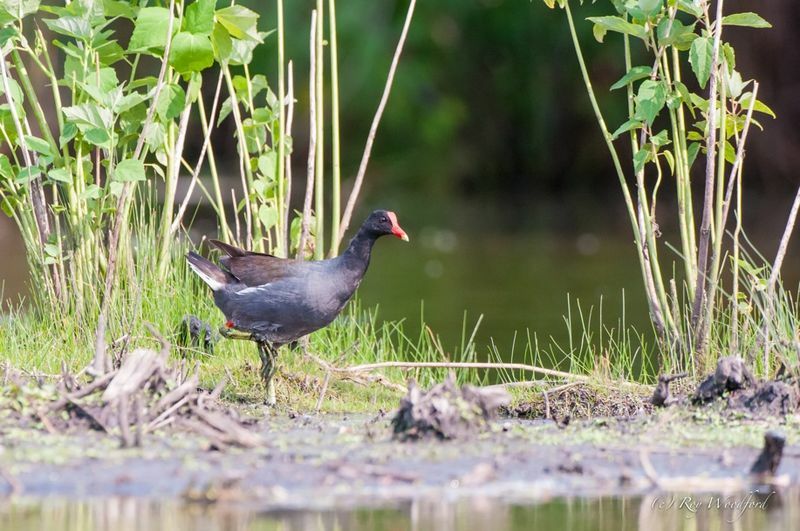 I'm sticking with Common Moorhen. I found five of these guy in Kearny Marsh on Sunday afternoon. I got a few shots as they ran for cover. 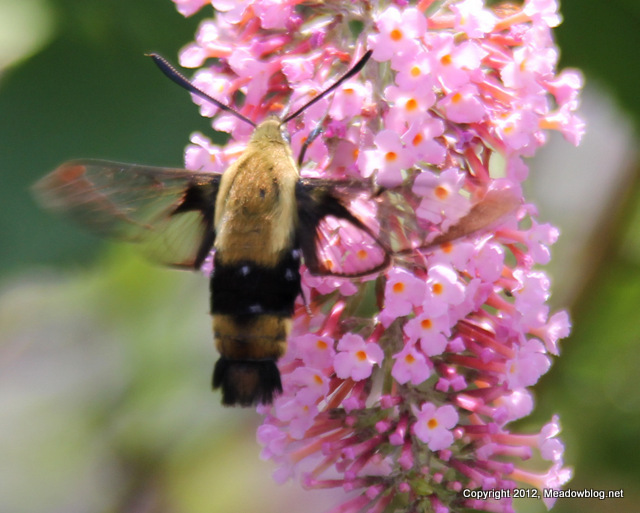 Sunday’s Butterfly Walk — 15 Species! 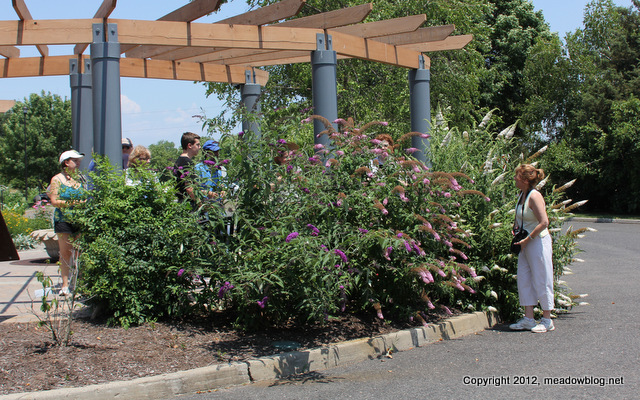 Sunday's Butterfly Talk and walk was a big success — if you didn't mind a little heat. The butterflies sure didn't. 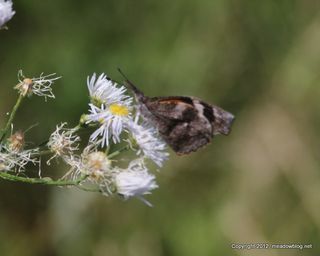 During the day we saw 15 species of Butterflies, including a second-ever-reported-for-DeKorte American Snout (one of the ugliest names for a butterfly). See fleeting photo at right. To see the North American Butterfly Association's checklist for DeKorte Park, click here. 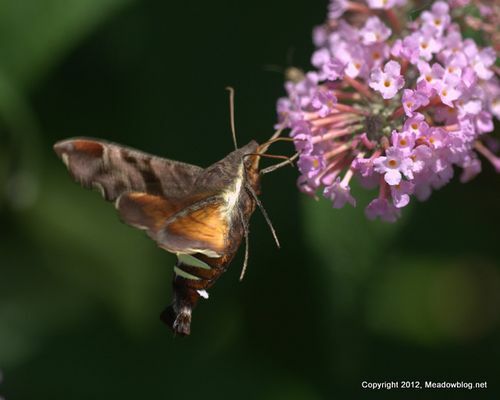 That elusive Nessus Sphinx Moth that Regina Geoghan photographed last week was back at the Butterfly Bushes today (above) — joined by a Clear-winged Moth (below), Painted Ladies, Red Admirals, Common Buckeyes (a first for the year) and tons of Skippers. If the weather holds, DeKorte should be great for butterflies and moths for the next few days. 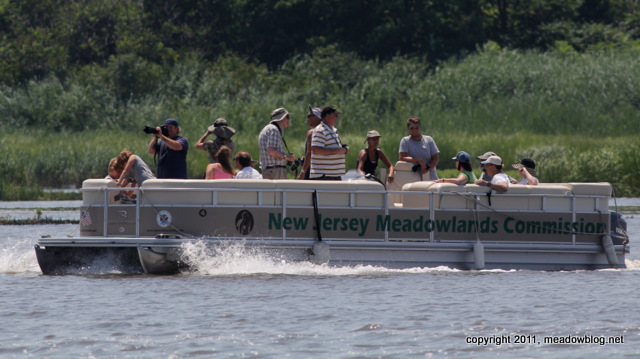 Our Next Birding Event: By Pontoon Boat! Our next birding event with the Bergen County Audubon Society is our third annual Birding By Boat cruise on the Hackensack River and its marshes. We will see Ospreys, shorebirds, waders and more. The two-hour cruise is on Tuesday, July 17, at 10 a.m. Suggested donation is (the bargain price of) $15. Reserve your seat now! For a list of birds we saw on last July's trip, click here. 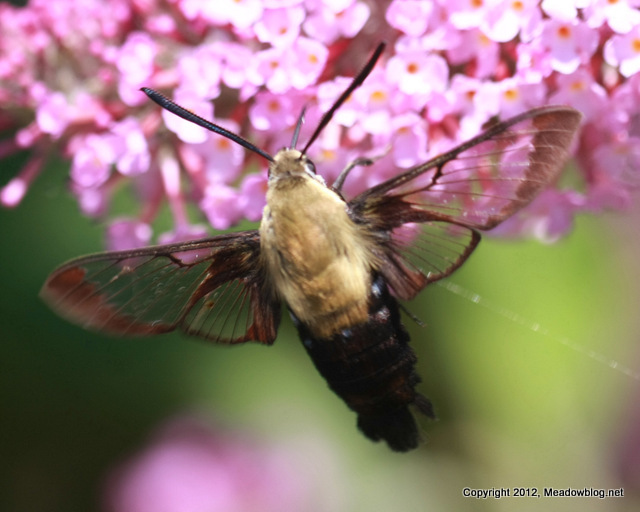 Note: You can also sign up for a Birding by Boat cruise scheduled for Tuesday, Aug. 28, at 10 a.m.
With Moth Night coming (and because we'd like a little help with this Clear-winged moth photographed at DeKorte at 3:30 p.m. on Sunday), we offer these two photos. 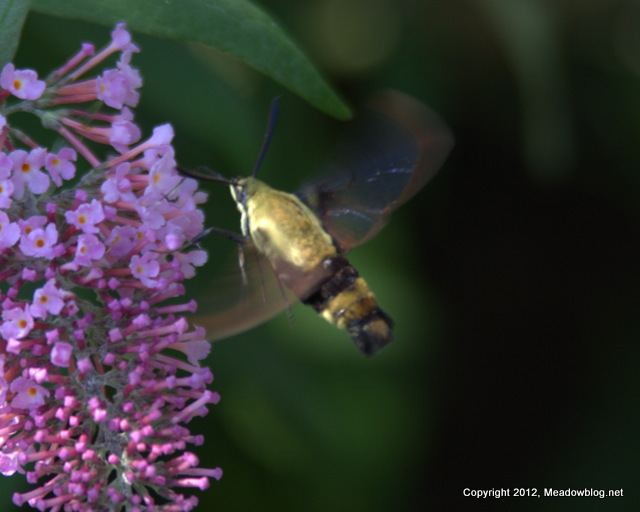 What is it — Hummingbird Clearwing or Snowberry Clearwing? Due to circumstances beyond our control, NJ Transit plans to repair the railroad crossing in front of DeKorte Park — starting Saturday, July 7. 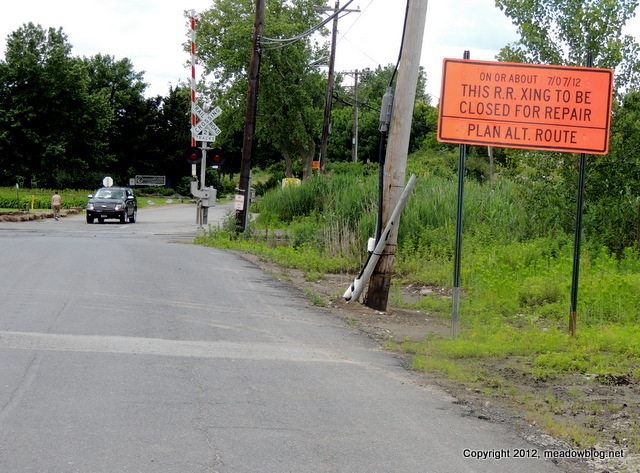 This means that access to DeKorte Park from Valley Brook Avenue will be blocked — most likely for two weeks. Access to DeKorte will be via Schuyler Avenue and Disposal Road. The link to alternate directions and a map is here. 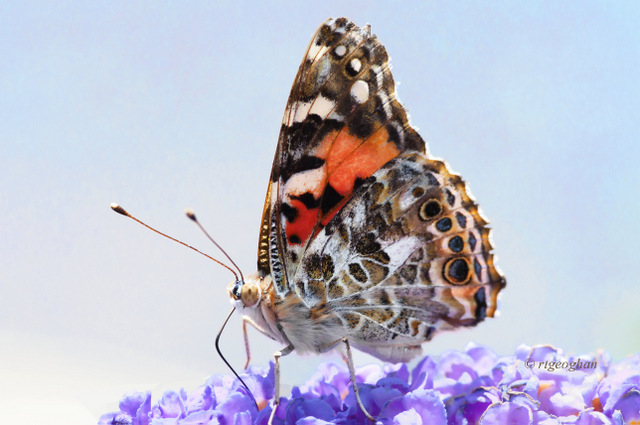 Since this month is unofficially Butterfly Month in the Meadowlands, we thought we'd toss out some appropriate teasers — like the one above.